Ever wondered what a Recruiter does everyday or how they would describe their work through the medium of music? Well, you’re in luck, the team in Allen Recruitment have shared their Recruitment soundtracks, to give some lighthearted perspective on their working days. Oh, and not to worry, you won’t see anyone reference to the Dolly Parton classic “Working 9-5”. Katie’s first soundtrack of choice is “Hello” by Adele, quoting the line “I must have called a thousand times”, as most recruiters know, some candidates are harder to get on the phone than others! So, what about the Script’s song, “The Man Who Can’t be Moved”, well Katie’s says this is the guy who rejects that offer for a counter offer from he’s current employer. He’s not moving! Clearly a fan of Grease the musical or maybe just a fan of finding the purple squirrel! Brian’s has chosen “You’re the one that I want” as his recruiting soundtrack. Another classic from Rebecca, “Don’t go Breaking my Heart” by Elton John and Kiki Dee. A song that is usually associated with love and heartbreak but not this time! Rebecca associates this song with a client who internally fills/ closes the role or even when you’ve waited for a CV for (what feels like) ten years and the candidate sends it in PDF form! “Cause you’re hot then you’re cold, You’re yes, then you’re no, You’re in, then you’re out, You’re up, then you’re down”, sound familiar fellow Recruiters? A pop song from Kathy Perry, “Hot N Cold”. Reflecting both candidates and clients, as Adriana knows oh too well how quick someone can change their mind on a role. 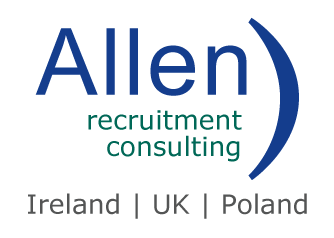 In Allen Recruitment we live for the search, continually searching for the perfect candidate, or perhaps you could even call the ideal candidate a Hero. Filling that role you never thought possible, until a Hero comes along. So, it makes sense that Louise chose M People, “Search for the Hero” as her recruiting soundtrack. Liam loves the Recruiter life, and what he does. However, he’s says like every job it comes with its ups and downs. So, he has chosen Ronan Keating “Life is a Rollercoaster”. This song is also a karaoke favourite for Liam!